Your subconscious mind holds the key to developing brilliant power trading skills! This Master Power Trading Hypnosis MP3 will help you tune into your natural ability to use your intuition when it comes to stocks, commodities, FOREX, etc… Additionally, this hypnotherapy recording on trading will help you have the discipline to either learn or develop a trustworthy and straight forward system which you can apply to your trading activities. The idea is that you will have much greater success in trading than you have previously experienced. If you have had a previous, prosperous trading experience, this recording will help you recapture and emulate that experience so that you can repeat it over and over in different ways in the future adding to your portfolio and therefore your secure financial future. Steve G. Jones, Ed.D., Clinical Hypnotherapist, charges $1,500 for a custom recording and $25,000 for a one-hour private hypnotherapy session at his office. But you can get all the benefits for this low price. Simply listen to the Master Power Trading Hypnosis MP3 download every night as you go to bed for three weeks and feel the changes happening in your life. You will feel more empowered, more in touch with your true self, and you will truly know that your goals are within your reach. Steve G. Jones achieves AMAZING and LASTING results!!! Hypnosis is the easiest way to affect change in your life because the positive messages go straight to your subconscious mind effortlessly so you can accomplish your goals and reach for the stars!! All you have to do is listen to the Master Power Trading Hypnosis MP3 audio at night as you go to sleep!!! You’ll hear soft music, the gentle sounds of the beach, and the soothing sound of Steve G. Jones’ voice all working together to bring about positive changes in your life easily and naturally. Steve G. Jones has been helping people improve their lives with hypnosis for over 17 years…now it’s time for him to help YOU… don’t wait, do it NOW !!! you’ll be glad you did. See you at the top! And as you continue relaxing deeper, deeper and more deeply relaxed, you realize just how powerful you are. You realize what a powerful trader you are. You are able to make more money on your winning trades. You are able to reduce your losses on losing trades. You use powerful trading strategies to improve your opportunities for profits. You seek out these opportunities to learn and you only apply the strategies that work. Most importantly to allow abundance in your life, to allow yourself and your family to live abundantly, having all of your need met. You are comfortable with wealth. You are comfortable with success. You only pay attention that work and you ignore all other strategies. You choose to go in a direction with you trading that is not necessarily what everyone else does. You take your time to learn trend analysis, to study trends and analyze them so that you can make accurate predictions. You have a plan. Your plan includes profit targets on each and every one of your trades. And you also have an exit plan on each of your trades because you are a careful planner. You are beginning to trust yourself and your skills in trading. You unlock the secrets to success in your mind because your mind is like a powerful computer and it pays careful attention to market trends and calculates accurate, logical predictions. Even while sleeping, your subconscious mind calculates accurate, market predictions and reveals them to you during your waking hours so that you must learn to trust what you would consider to be your intuition, which is simply your subconscious mind, your computer if you will passing powerful, logical, well thought out knowledge to your conscious mind so that you can act on it, but you must act on this information and trust yourself. I’d like you now to imagine yourself, perhaps a year from now, perhaps five years from now living your dream, that’s right. What do you want to achieve by trading successfully? Imagine those things now in your life. What kind of car would you like to have? What kind of house? If you are simply interested in security, what kind of savings account, what kind of portfolio will you have one year from now or five years from now? Now imagine thirty years from now. See the things in your life or perhaps the things you have passed on to loved ones, the things you have gained through powerful trading techniques, that’s right. Imagine yourself enjoying those things or perhaps your loved ones are enjoying them. See it. Make it real for you. And now realize that you will move powerfully in the direction of successful trading, trusting yourself and seeking out new knowledge which you can apply, because the more knowledge you feed to your subconscious mind, the better answers it can produce while you relax or sleep so that it can then give the answers to your conscious mind when you are awake. And as you continue relaxing deeper and deeper and more deeply relaxed, I would like you to think of a major incentive in which you are working toward, in which you would like to achieve in the future. I would like this to be a goal which you can achieve through trading, through powerful, accurate, appropriate trading. It might be an ocean cruise or seeing a child graduate from college, or building your dream home. In fact it can be almost anything, but whatever it is, this goal should be an important one and one that is within your power to achieve as a trader. Most importantly, this goal should be something which is the result of your efforts and your intuition. When you have the goal firmly in mind, I would like you to picture yourself transported into the future, savoring the fruit of your achievement and enjoying the knowledge that the goal for which you have worked for so long and so diligently is finally yours. Continue now to keep this image firmly in your mind, focusing on it, that’s right, making it very clear. Very soon as I speak it will be as if you are actually there, that’s right. Let yourself begin to live the experience now. Through trading you have achieve what you have set out to do and the rewards for your efforts are yours to enjoy. So I would like you now to imagine really living the fulfillment of your goal and allowing yourself to feel all the fun, all the joy, all the excitement, all the satisfaction which comes from knowing that your ambitions have at last been realized. Allow yourself now to really feel the full excitement of that achievement and a job really well done. Make it real for you. Notice any colors associated with that event or that moment, that’s right. Notice any smells associated with it, any sounds. Notice how your body feels. Notice the clothing you are wearing and it finally pays off. In other words, make it real for all of your senses now, sight, sound, smell, touch, everything. And now intensify everything. Make it even more real. Make the sounds louder, the sights more clear and bright, the smells more intense, the feeling in your heart more clear, the feeling of your clothing and the temperature in the air more clear. Make everything more clear and more vivid now. And as you relax and allow yourself to let go completely and really feel this even completely, savoring your victory and everything that goes with it, the feelings of fulfillment, the feelings of having made it will become clearer and clearer and more powerful with every passing moment now. And in a short time I will finish talking and let you drift off to sleep, but until that time allow yourself to continue to enjoy feeling the fulfillment of having reached the goal which you worked so diligently to obtain. And as the feelings of achievement and satisfaction grows stronger and stronger within you, each passing moment finds them stronger than they were the moment before and now really get in touch with who you are, a powerful person, an amazing, intuitive, dedicated, determined, intelligent, smart person. Your trading powers are matched by none. You are the leader of the pack. It is time for you to realize this fact. It is time for you to make the transition from student to master. I want you now to imagine an ocean in front of you. I want you to imagine that you are in a very sturdy, sea-worthy ship. The sides of the ship are very high. They can block even the highest wave in the deepest part of the ocean. This is the ship of your determination and your integrity and your skill. That powerful combination seals every board on this ship making it water tight. That powerful combination keeps the sail firm so that it can use the wind appropriately. That powerful combination allows you to navigate swiftly, skillfully, and easily through even the choppiest waters. See yourself sailing now through the waters, high as the waves may be. You are safe because you focus on the other side, you focus on your destination. As a skilled trader, you trust your intuition and that is exactly what you are looking at now in the distance, the physical representation of your intuition. You know what to do, you follow it. See yourself going through those seas now. The winds blow the rains come, the waves lapping at the boat, but you are safe and steady and calm and resolute and you are still moving forward toward your goal, always keeping your eyes on your goal. See yourself arriving at that goal now, that’s right. And I offer this illustration to show you that although it can seem difficult, it is really very simple. All that is required by you is you is focus. Using your laser like focus, using your skill, using determination, using everything you have, using every single mental and emotional resource you have to get to the other side. And as you see yourself there again, notice that it was worth it. You can make a lot of money by improving your trading skills! Being successful at trading takes careful planning and acute skills at being able to read the market. This amazing self-hypnosis recording, Master Power Trading Hypnosis MP3 session, will give you the skills you need to be a successful power trader! Hypnotherapy works by targeting your subconscious mind. A lot of times, people who trade let their emotions and feeling get in the way of their instincts. Your instincts are normally right, it’s the emotions that get in the way. This hypnosis session will teach you to put all emotions aside and be able to read the market with great skill and acuity. We suggest you listen to this recording for 21 nights in a row before going to bed. 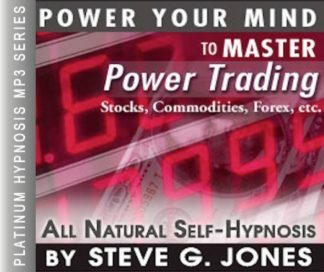 As you listen to the hypnotherapy recording, powerful suggestions given by Steve G. Jones will start to become embedded in your subconscious mind making you a powerful and successful trader! You have the ability to make a lot of money, let Power Trading self-hypnosis help you will your goal!